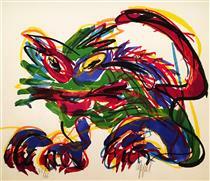 Christiaan Karel Appel was a Dutch painter, sculptor, and poet. 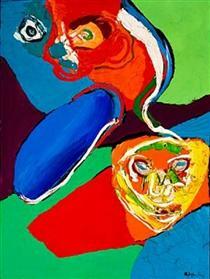 He started painting at the age of fourteen and studied at the Rijksakademie in Amsterdam in the 1940s. 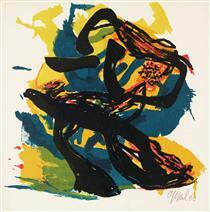 He was one of the founders of the avant-garde movement CoBrA in 1948. 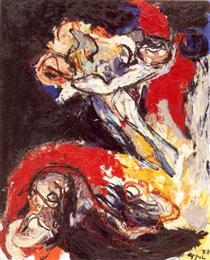 ''To paint is to destroy what preceded. 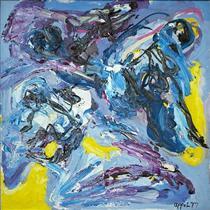 I never try to make a painting, but a chunk of life. It is a scream; it is a night; it is like a child; it is a tiger behind bars''. 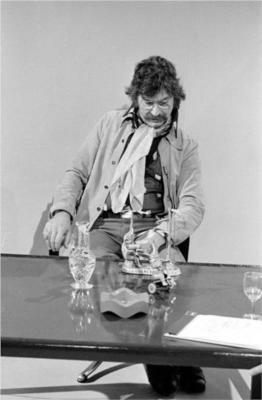 Christiaan Karel Appel (pronounced [ˈkrɪstijaːn ˈkaːrəl ˈɑpəl] ( listen); 25 April 1921 – 3 May 2006) was a Dutch painter, sculptor, and poet. 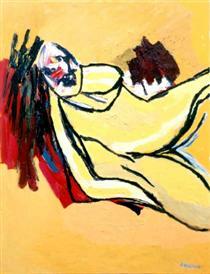 He started painting at the age of fourteen and studied at the Rijksakademie in Amsterdam in the 1940s. 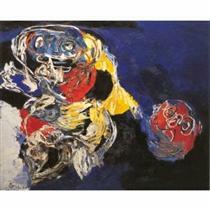 He was one of the founders of the avant-garde movement Cobra in 1948. 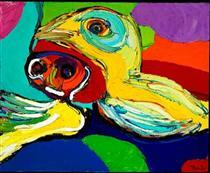 He was also an avid sculptor and has had works featured in the museum of Great Samo and MoMA. 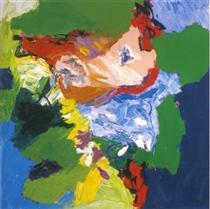 Christiaan Karel Appel was born on 25 April 1921 in his parents' house at Dapperstraat 7 in Amsterdam, the Netherlands. As a child he was often called 'Kik'. On the ground floor his father, Jan Appel, had a barbershop. His mother, born Johanna Chevalier, was a descendant of French Huguenots. 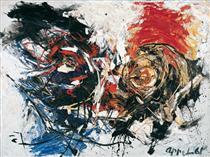 Karel Appel had three brothers. 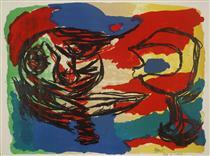 From 1940 to 1943, during the German occupation, Appel studied at the Rijksakademie van Beeldende Kunsten in Amsterdam, and it was there he met the young painter Corneille and, some years later, Constant; they became close friends for years. His parents opposed his choice to become an artist, leading him to leave home; this was also necessary because he needed to hide from the German police so that he would not be picked up and sent to Germany to work in the weapons industry. 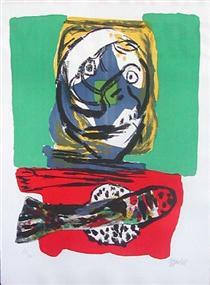 Appel had his first show in Groningen in 1946. 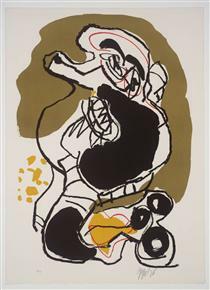 In 1949 he participated with the other CoBrA artists in the Stedelijk Museum Amsterdam; this generated a huge scandal and many objections in the press and public. 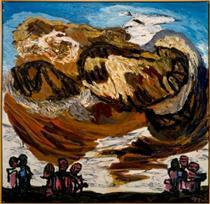 He was influenced by Pablo Picasso, Henri Matisse, and the French brute-art artist Jean Dubuffet. 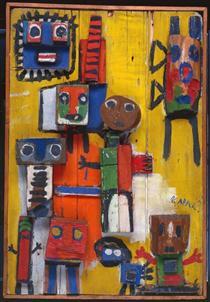 In 1947 he started sculpting with all kinds of used materials (in the technique of assemblage) and painted them in bright colors: white, red, yellow, blue, and black. 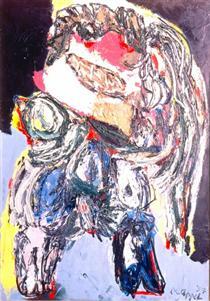 He joined the Experimentele Groep in Holland together with the young Dutch painters Anton Rooskens, Theo Wolvecamp, and Jan Nieuwenhuys. Later the Belgian writer Hugo Claus joined the group. 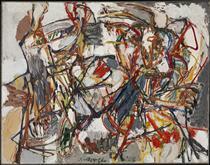 In 1948 Appel joined CoBrA (from Copenhagen, Brussels, Amsterdam) together with the Dutch artists Corneille, Constant, and Jan Nieuwenhuys (see also Aart Kemink), and with the Belgian poet Christian Dotremont. 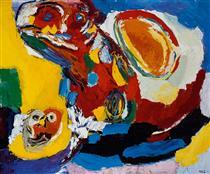 The new art of the CoBrA group was not popular in the Netherlands, but it found a warm and broad welcome in Denmark. By 1939, Danish artists had already started to make spontaneous art and one of their sources of inspiration was Danish and Nordic mythology. It was also in Denmark that the CoBrA artists started cooperating by collectively painting the insides of houses, which encouraged and intensified the exchange of the typical 'childish' and spontaneous picture language used by the CoBrA group. Appel used this very intensively; his 1949 fresco 'Questioning Children' in Amsterdam City Hall caused controversy and was covered up for ten years.